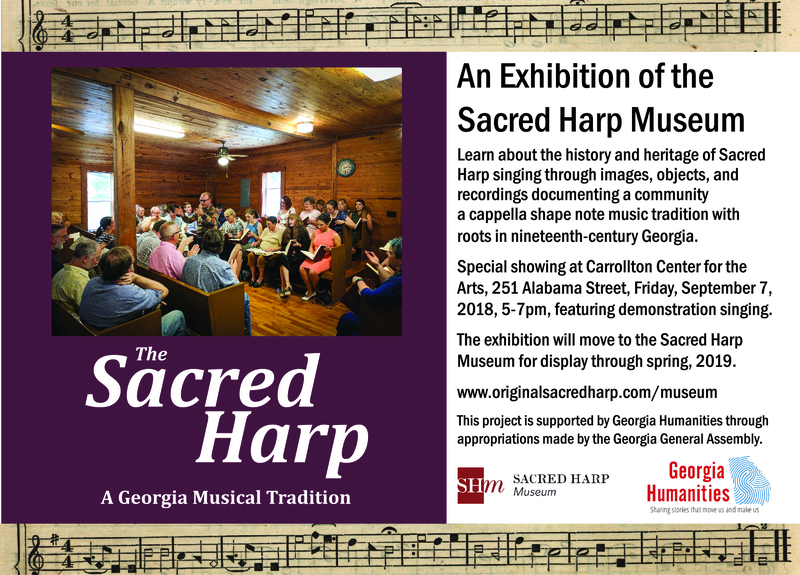 The Sacred Harp Museum, with support from Georgia Humanities, is launching a new exhibition, Sacred Harp: A Georgia Musical Tradition. The Carrollton Center for the Arts, 251 Alabama Street, Carrollton, GA, will host a special community opening featuring demonstration singing on Friday, September 7, 2018, from 5-7pm. Curated by Nathan Rees. The First National Sacred Harp Singing Convention: In 1980, singers from around the nation took part in a new convention that honored the heritage of Sacred Harp tradition while celebrating the growth of new singing communities. This online exhibition brings together documents, images, and recordings to tell the story of the first National Sacred Harp Singing Convention. Curated by Nathan Rees. Since its first session in Atlanta in 1905, the United Sacred Harp Musical Association, commonly known as the United Convention, has stood out as more than just an ordinary Sacred Harp singing. The story of the United Convention—told here through recordings, photos, and more—offers a fascinating perspective on the history of Sacred Harp singing in the twentieth century and beyond. The Sacred Harp Museum hosts a yearly resident intern as part of a sustained effort to catalog, digitize, conserve, build, and improve access to the museum’s unparalleled collection. Read about 2016 intern Sasha Hsuczyk’s internship. The Sacred Harp Headquarters and Museum at Oak Grove Road, Carrollton, Georgia, features a growing collection of Sacred Harp and other shape-note songbooks, histories, and recent academic research, minutes, periodicals, and scrapbooks. The building contains a large meeting room, offices, guest bedroom and bath, kitchen, and a museum featuring historic songbooks and memorabilia. The Headquarters and Museum was built on land donated by the Denney Family. The Sacred Harp Headquarters and Museum offers visitors—interested singers and scholars alike—an unparalleled glimpse into the history of Sacred Harp singing. The museum also makes an excellent addition to a trip to a West Georgia Sacred Harp singing. See detailed scrapbooks containing newspaper and magazine clippings from Sacred Harp events through the ages. The Sacred Harp Museum gratefully accepts donations of songbooks, correspondence and personal papers, minutes, photographs, audio and video recordings, press clippings, and other material related to Sacred Harp singing. Donating such materials to the Sacred Harp Museum ensures that they will be preserved, archived, and made accessible to interested singers and scholars for generations to come. The museum features a dehumidifier to ensure the stability of fragile materials. The rarest items are protected in a fireproof storage cabinet. Sacred Harp Publishing Company Citations, curated by Karen Rollins. Since 1969, the Sacred Harp Publishing Company has awarded posthumous citations to “teachers, writers, or outstanding supporters and leaders of Sacred Harp music” who were company stockholders. This exhibition describes the history of the citation program, and lists all citation recipients. National Sacred Harp Newsletter, 1985–1993, curated by Jesse P. Karlsberg. At its peak, the National Sacred Harp Newsletter reached the homes of a thousand Sacred Harp singers each month. This exhibition, which coincides with the launch of the Sacred Harp Publishing Company Newsletter, presents a growing collection of the National Newsletter‘s back issues. “Digitized Version of J. L. White’s 1909 Fifth Edition of The Sacred Harp,” curated by Nathan Rees. A downloadable, searchable, version of the first of J. L. White’s three different attempts at revising the Sacred Harp between 1909 and 1911. The book is a rarity in part because it was rejected by most Sacred Harp singers, who felt that White’s modernized harmonies and added gospel music ventured too far from tradition. “Barrett Ashley on Life and Sacred Harp, in Conversation with Jerry Enright,” curated by Karen Freund and Jesse P. Karlsberg. A transcript and recording of a 1993 conversation between Collingsville, Alabama, singer Barrett Ashley and Chicago, Illinois, singer Jerry Enright, on Ashley’s life, the times he’d lived in, and his lifelong love of Sacred Harp singing. “Melancholy Day”: Letters of Condolence after the Death of Thomas Jackson Denson, curated by Jesse P. Karlsberg. Sacred Harp singers from across the South wrote to Paine Denson sharing their memories after the death of his father, singing school teacher, leader, and composer Thomas Jackson Denson. These letters express the profound impact T. J. Denson had on the “hundreds, yea, thousands, of people throughout the country whose hearts [were] lacerated with grief” by his death. “Minutes of the 1965 United Sacred Harp Musical Association,” curated by Jesse P. Karlsberg. A transcript and downloadable, searchable, version of the complete minutes from the 1965 United Sacred Harp Musical Association, held in Nashville, Tennessee. The session featured a special memorial to Sacred Harp scholar George Pullen Jackson. “There Are More Singings Now Than Ever Before”: Hugh McGraw Addresses the Harpeth Valley Singers, curated by Nathan Rees and Jesse P. Karlsberg. In 1964, Hugh McGraw, then executive secretary of the Sacred Harp Publishing Company, gave a talk on the past, present, and future of Sacred Harp singing for the Harpeth Valley, Tennessee, Sacred Harp singers. This exhibition presents an excerpt from his talk. The museum is open by appointment only. To inquire about visiting, e-mail Nathan Rees, museum curator. From Carrollton, take U.S. 27 South out of the city and past the 166 Bypass 2 miles to Oak Grove Road, on your right. Turn right onto Oak Grove Road and the Sacred Harp Headquarters and Museum building and land will be on your left. You can also use this map of Oak Grove Road from Google Maps. Several hotels are conveniently close to our Museum in Carrollton and the immediate vicinity.